The Wonders of Backyard Water Features - Aquascape, Inc.
Maybe you’re entertaining the idea of melding the wonders of water right into the landscape that surrounds your home? Home is the place you go to relax and to let yourself go. You’re wondering what’s possible to make your home more of an escape from reality. Well, try adding water! Here are a few ideas of the possibilities that can be done to the average home’s landscape. A pond does not have to take up your entire yard to become a piece of your very own home getaway. Don’t have much of a yard to deal with? How about incorporating a fountain? Enjoy the sights and sounds of splashing water as your mind drifts away from the daily stresses in your life. Live in the city or only have access to a balcony or rooftop? Take advantage of a smaller contained water feature. Aquascape’s Fire Fountain would make a great option to introduce the benefits of soothing water into the hustle and bustle of the city life. There is always the option to fully submerge yourself in the water garden lifestyle and transform your entire backyard into a beautiful aquatic getaway. Maybe you prefer relaxing in your front yard? 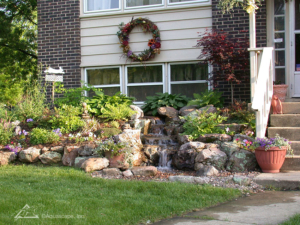 A Pondless® Waterfall could be a great option that is sure to turn heads as people stroll by. Think about it, when you start to drift off while relaxing on that wooden swing of yours, do you imagine an unadorned landscape or do you dream of being alongside a gentle stream, a calming pond or the beautiful colors of the ocean hitting your toes as you sway back and forth? Bring part of that dream to life and take advantage of the many benefits water has on relieving the tensions of life that come upon you.